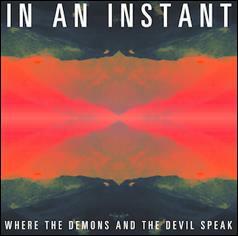 In An Instant are a Northern Irish quartet from Bangor who, since their formation in 2013, have received considerable acclaim for their creative blend of indie rock and electronic dance music. In addition to this, they are renowned in the local music scene for their intense, cathartic live performances, which have been compared to artists such as Twin Atlantic, Foals and Biffy Clyro. In 2014, In An Instant released their debut EP, ‘Light You Know and Love’, to a very positive reception, with lead single, ‘Something Right and Something Real’, garnering airtime from BBC Radio 1, BBC Radio 2, and BBC Introducing. After taking some time to develop their craft, In An Instant have returned with an energetic new single entitled ‘Where The Demons And The Devil Speak’. Immediately, our ears are drawn to the propulsive rhythmic motif that recurs throughout the track, which is complimented perfectly by the particularly melodic and expressive lead guitar parts. In this respect, comparisons can be made to artists such as Two Door Cinema Club and The 1975. In addition to this, lead vocalist Mark Hegan delivers one of his most impassioned vocal performances yet, with his poetic and plaintive lyrics remaining as powerful as ever. The new single will be out Friday 8th July 2016 in all the usual places. Keep an eye on this and stay tuned for more from In An Instant in 2016.